Learn about adolescent vaping at the Community Conversation Series hosted by Erie County Legislator John Bruso. Sponsored by the Alden Substance Abuse Coalition and FOCUS - Lancaster Depew Area Addiction Prevention Coalition, the conversation will be held March 6 from 6-8 p.m. at the Lancaster Opera House, 21 Central Ave., Lancaster. 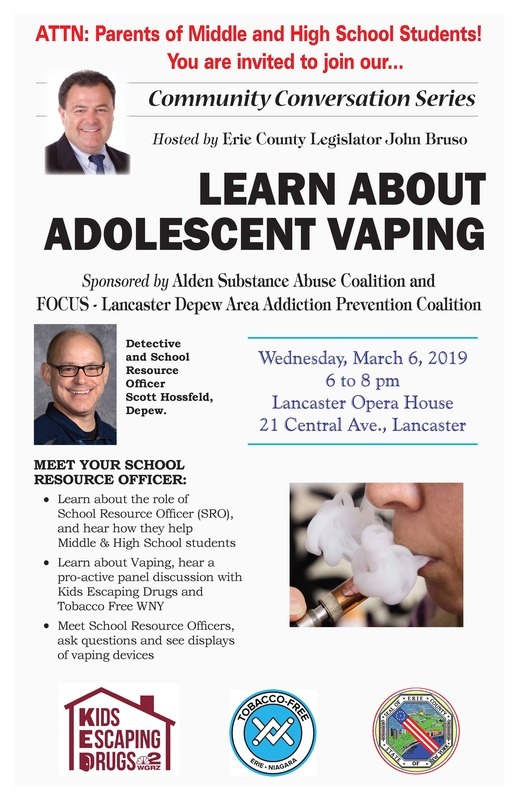 Middle and high school parents are encouraged to attend to learn about the role of a school resource officer and how they can help students, learn about vaping and hear a proactive panel discussion with Kids Escaping Drugs and Tobacco Free WNY. Attendees will also be able to meet school resource officers, like Depew's Detective Scott Hossfield, ask questions and see displays of vaping devices.